U.S. Flag Store's Massachusetts State Flag is printed in America on Nylon flag fabric. Since this flag is made in America, U.S. Flag Store is able to ensure that the complex State emblems are printed with accuracy, sharp detail and bright colors. This outdoor Massachusetts State Flag is finished with the same high quality materials as all of U.S. Flag Store's US flags, and is extremely durable and long lasting. 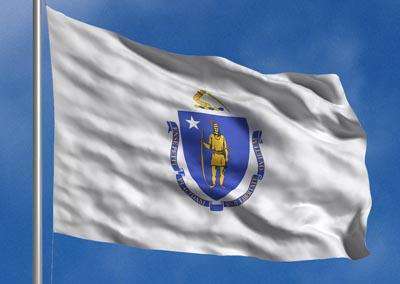 Design: A white flag with the Massachusetts state seal placed in the center. The seal consists of a blue shield with an illustration of a Native American holding a bow and arrow and a white star. Placed above the shield is bent arm holding a sword, and at the bottom of the shield is a banner with the state motto: "Ense Petit Placidam Sub Libertate Quietem" or "By the Sword We Seek Peace, But Peace Only Under Liberty". Meaning: The arrow held by the Native American points downwards, in order to signify his peaceful intentions. The white five-pointed star represents Massachusetts as one of the first 13 U.S. colonies. Massachusetts first gained statehood in 1788, but they did not adopt an official state flag for over 100 years. Finally, in 1908, Massachusetts created a state flag that was somewhat similar to the current Massachusetts state flag. This original state flag had the same white field and blue shield, but then only added a pine tree instead of the other adornments added to the current flag. This design remained the same until 1971, when the flag was changed to its current design. The design was approved on June 2nd of 1971, and officially put into effect on November 1st, 1971. The Great Seal of Massachusetts is made up of a blue shield, an Algonquin Native American man, a five-point white star, and an arm holding a sword. Blue is used for the shield and ribbon in order to represent the Blue Hills of Massachusetts. The Native American man wears a shirt, leggings, and moccasins. He holds a golden bow and arrow, with the point of the arrow pointing down to signify that he is peaceful. The five-point star is white in order to match the white stars on the American Flag, and represents Massachusetts as one of the original 13 U.S. colonies. Bellow the shield is a ribbon with the motto of Massachusetts printed on it: "Ense Petit Placidam Sub Libertate Quietem" .